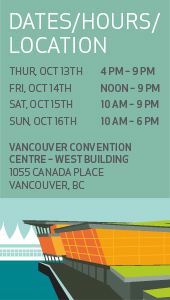 The fall favorite Vancouver Home + Design Show kicks off this Thursday & I’m pleased as punch to have a booth. You’ll find the Cagey Bee goodness nestled in a special section of vendors from Portobello West, running along the far wall (from the entrance), right beside the stage. Since I’m usually trapped in my booth at these kind of shows, I’m excited to be near the stage so I can catch Jillian Harris, the design expert on Extreme Makeover: Home Edition. The Urban Barn Design Stage will also host presentations by Bryan Baeumler, host of Disaster DIY & House of Bryan. Hopefully I can sneak away to catch some of the cooking demos at the Cook Like a Pro area. I definitely want to see the Contained Living setup too. The designer has such perfect transformations for small spaces – like a “shed” package that functions as a home office in your backyard. Brilliant! Check the website for a full schedule. Next postGot Craft Postcards Fresh From the Printer! Ever since I saw your art some three years ago, I have been a HUGE fan. It was such an honour to meet you in person yesterday at the Vancouver Home Show. I look forward to your continued work. I wish you all the success in the world along with happiness and joy.